I know from experience that having a dog run away can be absolutely devastating. There’s a lot of door-to-door searching, posting lost signs on street posts and in store windows and often, a lot of heartbreak – only 10% of runaway dogs find their way back to their owners. That’s a sad statistic, but there’s hope that modern technology may be able to help improve those numbers. A San Francisco-based company recently launched an app called Finding Rover (iOS), designed to help reunite lost dogs with their owners using facial recognition technology. You can use the app to create a profile for your pet using a forward-facing picture, which you no doubt already have on your phone. If you don’t already have a picture of your dog – and let's be honest, getting a good picture of a fidgety puppy can be darn near impossible – the app comes with a bark button to get Fido’s attention for a snapshot. Then, should your dog ever be lost, you can send out an alert to other Finding Rover users in your area to keep an eye out. If you’re a Good Samaritan type, you can also upload pictures of found dogs, along with the location where the pup was spotted. The app, though still new, has already reunited a handful of lost pets with their owners. And while you might have trouble using Finding Rover effectively outside a larger city, anything to boost the odds of finding a lost pet is certainly welcome. Finding Rover is a free download on the Apple App Store. An Android version is on the way, as is a version for our missing feline friends. 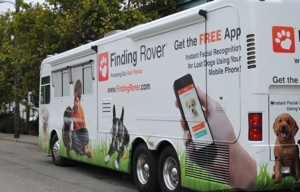 For more about the app, visit findingrover.com. And, check out these other great apps for pet owners.